Continued....We snacked here on fruit as Nex described the next section round to Wang Long, our final destination. Passing through Last Stop Island we came out into the brilliant sun just before 6 p.m. The temperature immediately went up but by now it had no fire in it. This article carries on from the first page Thailand Kayaking at it's best. In this we describe the start of the Kayak tour. We passed the “Rock Fall” after 5 minutes and Nex told us we were making good time so we could slow the pace a bit. The aim was to get to Wang Long by 6.45pm to see the sunset. At this time shoals of minnow white bait fish hanging under the cliffs jumped in waves of hundreds as their predators ensured one final meal before dark. The gray herons perching at the base of the cliffs danced, flapped and struck out at the fish as they jump in a perfect harmony. Soaking up those late sun rays, under huge cliffs, paddling free in such a spectacular setting, it made our hearts soar. This was perfect Phi Phi, far, far away from Village life and touro land. Approaching Wang Long at Sunset is stunning. Paddling through the 20 meter wide 200 m long cut into the cliffs of Phi Phi Don ends in a small 30 m beach is like entering the land time forgot. At the beach, the men protecting the birds nests camp out in a straw hut and the caves to ensure their harvest is undisturbed. The beach is shaded at this time of day so we quickly ate out chicken leg snack and went out to the moorings, just off the mini reef to take the extraordinary sight. The sun was a few degrees off the horizon and framed by the vertical cliffs of Wang Long. As the tropical sunset played out it’s nightly magic in front of our eyes, I was touched by the extraordinary moment. It seems so rare to capture such happiness. As the sea swallowed the sun, the mood had changed. The tour group had to return to the beach from where we had come. Fiona and Peter conferred with Khun Nex. They were losing energy and were worried about tiredness. In the silence they agreed to go as far as the Rock Fall before deciding whether they would take the longtail boat ride home. The nighttime was approaching. Khun Nex had explained we carried head lamp torches for safety. Although this sounded interesting the fear of the unknown is always good for concentrating, the mission was to get back. At the “Rock Fall”, Fiona transferred to the Longtail boat happy to follow us back in our nanny boat. The sky stayed lighter than the earth as the sun set way over head but the earth turned from twilight to a pre night glow. Turning the lamps on (mainly for safety against other boats at night.) we continued. Under the cliffs it was quiet dark but our night vision rarely used in normal life, sifted through the shades of grey and black to give a surprisingly clear sight . The sounds of night along the cliffs, the gentle lapping of the water on the bow of the boat, the sound of my own breathing mesmerized me. Tired we pulled on but in this state of awareness there was true satisfaction. With the lights of the village leading to our final port, Nex pointed upwards and showed us the starry night. Lying back in the kayak I sneaked a rest as Bill my partner continued to paddle on heroically. I can’t tell the difference between a Dipper or a Bear but I do know that star gazing defies wonder. 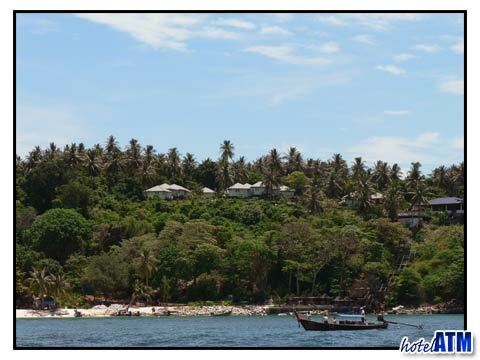 To organize this kayaking adventure guests must be staying over night on Phi Phi Island. This is because the last ferry from Phi Phi is 14.30 to Phuket and 15.30 to Krabi. This is an energetic trip requiring about 2-3 hours of continual work. You must have some fitness or do regular sport and be able to swim well. 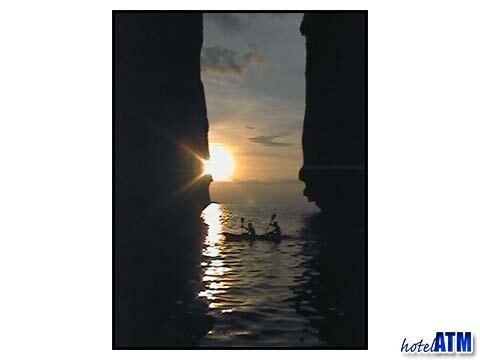 To return to the first page click Thailand Kayaking at it's best.